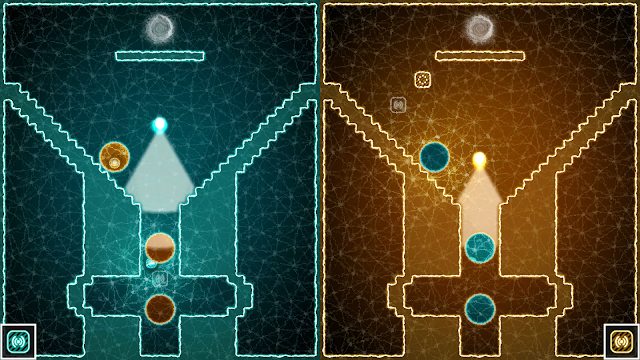 In Semispeheres you will take control of two spheres, one blue and one orange, to undertake a cooperative puzzle adventure of sorts. Using the relatively simple tools at your disposal you’ll need to figure out how they can help themselves and each other progress through each of the game’s levels that continue to get more intricate and challenging. I was able to arrange an interview with the game’s lone wolf developer, Radu Muresan, as he is preparing for the game’s debut on the Nintendo Switch this week. Starting with the staple question that everyone gets, you're at a conference and you've been asked to give a quick summary describing your game, looking to pump up the crowd. What do you say? RM: Normally I'd just say "It's a puzzle game, that's all you need to know". I found this approach worked best to maximize the element of surprise. For more demanding players, I'd say it's a "meditative parallel puzzle game", that's enough to at least make them curious. What games would you say most influenced or inspired the design and concepts behind Semispheres? RM: Mechanically the game was initially inspired by "Brothers - Tale Of Two Sons". In terms of progression and level layout, I looked up to games where the whole game is one big tutorial. Reviewing the game's website you have listed some awards that the game has won. How gratifying is it to have your work recognized in these sorts of ways among the work of your peers? RM: It's really satisfying of course, but I really enjoyed just seeing people play the game at all the events I showcased it. The left/right brain parallel control thing has cropped up a bit in the past year or so in a handful of titles, and I generally don't remember it being explored before then. Where did the inspiration to go with this style of play come from for you? RM: As mentioned above, "Brothers" was the initial inspiration. However, the control scheme is secondary to the duality of the worlds. Coupled with the slower pacing, I don't think I've seen any similar games that use this kind of control scheme - as most of them focus on the mechanical aspect first. While the puzzles continually get more challenging the overall look, sounds, and vibe of the game is always extremely mellow. Was there a specific objective behind this or is it just a style that seemed to suit the game you you wanted to make? 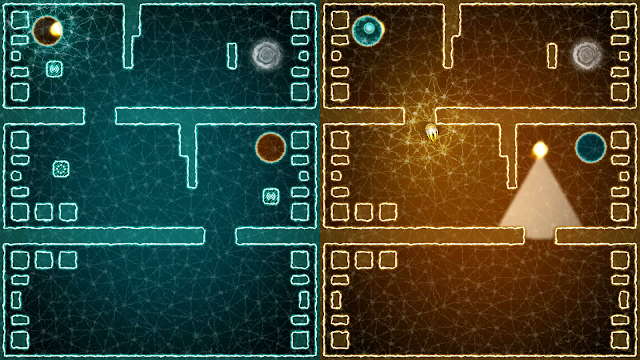 RM: Thinking in two separate, yet identical spaces can be very taxing so the whole look and feel of the game was designed to get you immersed and focused on the game. Anything that moves is very subtle, music is also great but just at the threshold of calling attention to it. I noticed a huge improvement in play style once I started showcasing the game with headphones - as it is the kind of game that you can't play while you do something else. Where in the process did the "boy and his robot" interlude story get introduced to the mix? Is there a specific way that it ultimately relates to the gameplay itself? RM: We're getting into spoiler territory, but the story is indeed connected to the gameplay. It's all revealed later in the game. What inspired you to decide you wanted to become a game developer? RM: I've always wanted to make games, but do so on my own terms. I started making games (again) in 2010 focusing on mobile and slowly transitioned into the PC/console space. As, for the most part, a lone developer what would you say are the biggest pluses and minuses of working on a game by yourself? RM: I really enjoy it, but it can get lonely. Fortunately, there are lots of great communities (online and in most bigger cities) and when there aren't, they're easy to start. I'm getting close to 3 years of running two different events locally that help a lot with getting the social interaction "fix" I need. Having already been released on the PlayStation 4 to some pretty positive reviews would you say you're happy with how the game has been received to this point? RM: I'm really happy with the outcome. There were lots of lessons learned, so I'm looking forward to my next title. 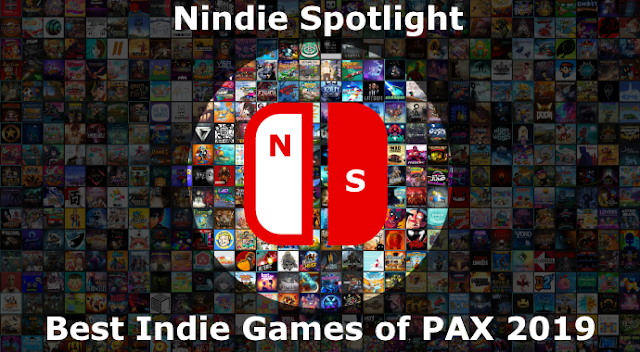 What has the process been like, as a lone coder, preparing the game to run on the Switch? RM: Overall I'd say it's one of the easier ones. There are still things to improve, but considering how early in the Switch's lifecycle this is, I'm fairly impressed. 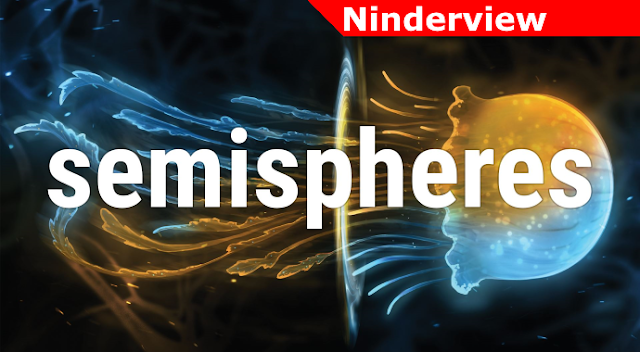 What would you say is the biggest positive you've seen while preparing to release Semispheres on the Switch? RM: Just holding the game in my hands felt really good. Taking the joycons out and playing like that was really interesting too. I also switched (ha!) the colors around just for the Switch release so they match the default placement of the neon blue/red joycons. Assuming you continue to find success for Semispheres have you begun work or planning for your next title? If so, any small hints? RM: I'm not finished with Semispheres yet, there are still a few more platforms I want to hit. I have a few ideas for my next title, the top of my list sounds too ambitious to mention just yet. Soon, most probably early next year! Many thanks to Radu for taking the time to answer my questions as he anxiously awaits the Semispheres launch on the Switch, and thanks as well to Christopher for coordinating. 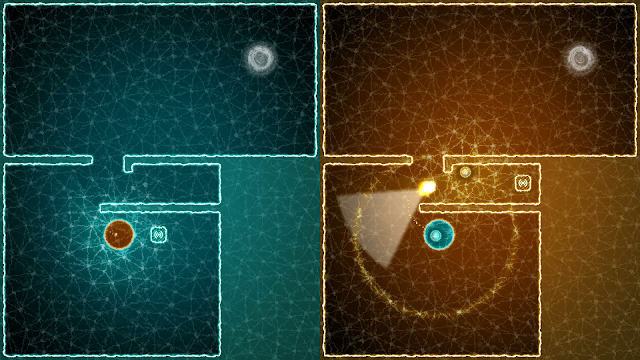 Semispheres will be available on the eShop Thursday, September 14th!